Since January 2009, but in that short space of time and with the help of a highly motivated, dedicated team of people, we have made great progress in improving cycling infrastructure and supporting this with promotions, events and information for our growing city. Impington, 2 miles north of Cambridge – I can cycle in via on-road routes or by using the excellent route alongside the new Cambridge to St Ives Guided Busway. With a mode share of 18% of all journeys made, cycling is already accepted as a normal, every day activity here and is not just a mode of transport for students. With continued investment our aim is to get cycling levels in Cambridge onto a par with Dutch cities. In the historic city centre, though private cars are banned, space remains limited and buses, taxis, pedestrians and the shear number of cyclists can make for the occasional bit of conflict. An every day cyclist who dreams of having enough time on my hands to be able to ride Land’s End to John O’Groats and to explore more of Europe by bike. What is you earliest cycling memory? Taking ownership of a black Raleigh Commando with chunky seat and 3 speed twist grip gears. Where is the best place you have ever cycled? I always find cycling through London very interesting as there’s so much to see that you would never stumble across if using buses, tube or car. In terms of new infrastructure it’s the brand new links that provide a more direct, pleasant and quicker route than going by car that make the biggest impact, and the best examples of this that I have been involved with are the award winning Riverside Bridge in Cambridge (Opened in 2008 and now has 1,900 cycle trips per day) and the Shelford to Addenbrookes cycle route (Opened in 2007 and now has 1,000 cycle trips per day). More ‘celebrity endorsement’, in other words influential, iconic people (pop stars, TV celebs, footballers etc) being seen to cycle, and to shun car use. What has been your favourite cycling experience? 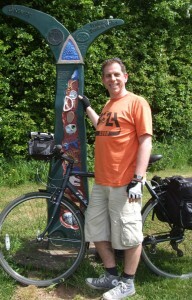 Doing the Coast to Coast ride (Workington to Tynemouth) with my eldest son in 2010 – The Way of The Roses is planned for 2011. What was your worst cycling experience? My youngest son was on my bike on a crossbar mounted seat, he managed to get his foot caught in the front wheel and that sent us both flying over the handlebars – fortunately the injuries were not serious. What is it about using your bike that you like the most? I enjoy cruising past traffic queuing into Cambridge in the mornings, and also being able to enjoy hearty meals without feeling guilty. The answers given are the opinion of the individual and do not necessarily reflect those of any organisation they may represent. This entry was posted on Tuesday, January 4th, 2011 at 10:13 am	and is filed under Personality of the month. You can follow any responses to this entry through the RSS 2.0 feed.